Last weekend I went with my wife and daughter to see the latest Spider-Man movie. I am a long time comic book fan so of course I loved it. But I was particularly impressed with the underlying theme of the movie. This wasn’t just an action packed superhero movie, there was a very clear message. That message was forgiveness. One scene in particular illustrated this message perfectly. 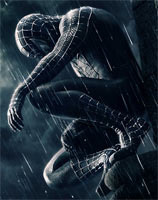 Spider-Man, finally consumed by hatred and revenge, realizes the terrible effect this has on his soul and flees to a nearby Catholic church. After spending some moments alone on the steeple (in prayer?) he descends into the bell tower and, with the help of the tolling bell, rips off the black garment he had been wearing which was an outward symbol of the vengeance within. It was such a powerful image and I thought, this is the healing power of confession! Though your sins be like scarlet, they may become white as snow; Though they be crimson red, they may become white as wool (Is 1:18). The more we sin, the further away from God we become. The sacrament of reconciliation is a sacrament of God’s love, mercy and forgiveness. He is always calling us back! Not only does it reconcile us with God, but also with our neighbor. When one offends God it consequently effects the rest of the Mystical Body of Christ, obviously in a negative way. Therefore, when we repent and offer penance for our sins we will, then, through the mercy and forgiveness of God, help others and repair the damage we have done.